Ann concentrates her work in the landscape, still life, and portraiture. 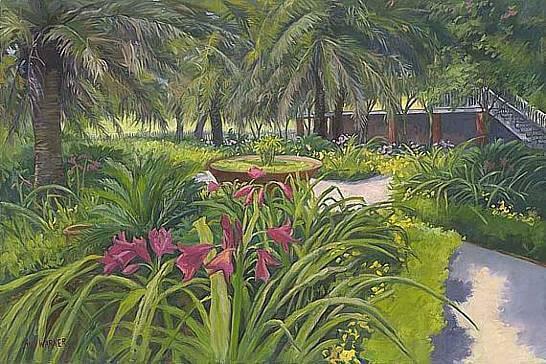 She loves to travel, and painting plein air (on location) has inspired much of her work. From Maine to Santa Fe, the Bahamas to the United Kingdom, France, Ireland, and Italy, each trip affords her "the opportunity to vary, stretch, and grow" her work. 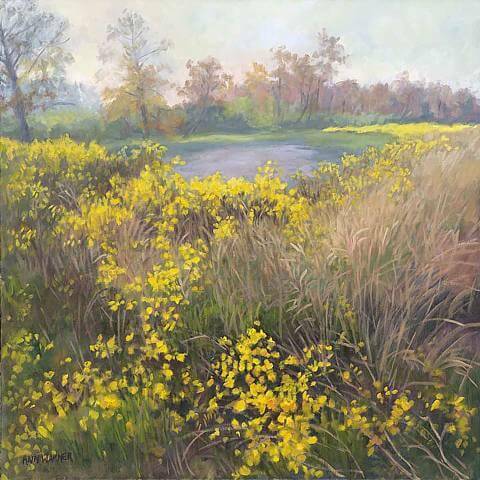 Ann has a Bachelor of Science degree from LSU, and was mentored by the late Carl Thorp, a noted oil colorist. Other artists who have influenced her development of artistic understanding and style are John Carlson, Charles Hawthorne, and Emile Gruppe. In past years, she has studied with such artists as Alfred Chadbourne, Charles Morvalli, Charles Sovek, John H. Sanden, Morgan Samuel Price, William White, Alice Williams, and Wolf Kahn. Favorite painters who have influenced Ann’s work are Sorolla, Cezanne, Van Gogh, Monet, and N. Fechin. 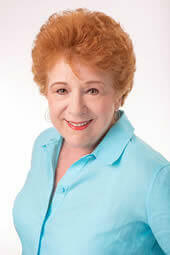 Ann teaches private art classes and workshops. Still life paintings have become a highly demanded part of Ann’s work. The vibrant flowers, fruit, and vegetables found in these paintings are mostly native to Louisiana, and many come from Ann’s own garden. 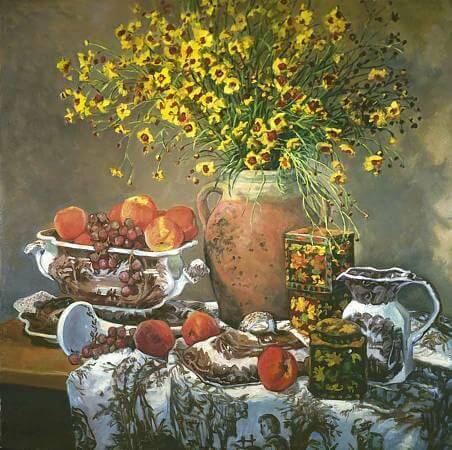 Ann Warner’s still life paintings are very much inspired by the Louisiana landscape and the season of the year. Many of the materials come from native fruits, vegetables, grasses, and other plant materials of Louisiana, Ann’s "favorite things." Fabrics, containers, and pottery show Ann’s interest in texture and color combinations. Taking her cue from nature, Ann works to see and find beauty in the materials of her area. Most of the still life plant materials run out of the picture plane as an influence of the large trees of the landscape that nestle in people and objects in Ann’s Louisiana home locale. These paintings try to capture the feeling for the place — the atmosphere, time of day, season, and location. Trips to such places as those of Ann’s European travels or those to different locations in the United States are an opportunity to have new experiences and interpret them throught the eyes of an artist. Even though the humidity and heat of Louisiana make it sometimes uncomfortable and taxing to be painting plein air, these same conditions give birth to the lush plant growth and beauty of the South. 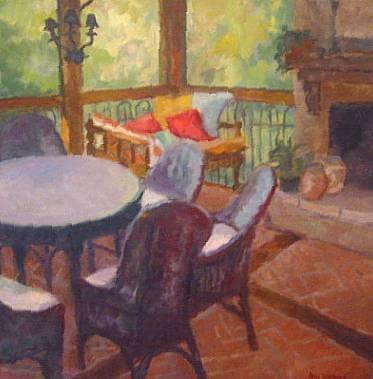 Of all the places where she has painted, Louisiana, rich with beauty, cultural heritage, and history, is Ann Warner’s favorite. Interiors of character have always been of interest to me. I like the intimacy of interiors, the color, the arrangements of objects, light, and design. Since I sometimes find that I am designing an interior in my nighttime dreams, painting inviting interiors seems a natural direction. My painting subjects have been well received by my art collectors. From a view through a dark room to the light in an early French kitchen to a table filled with workshop snacks during a group painting time, to rooms in my own home, I find my painting subjects. Copyright © 2000-2018 Ann Warner. All rights reserved.